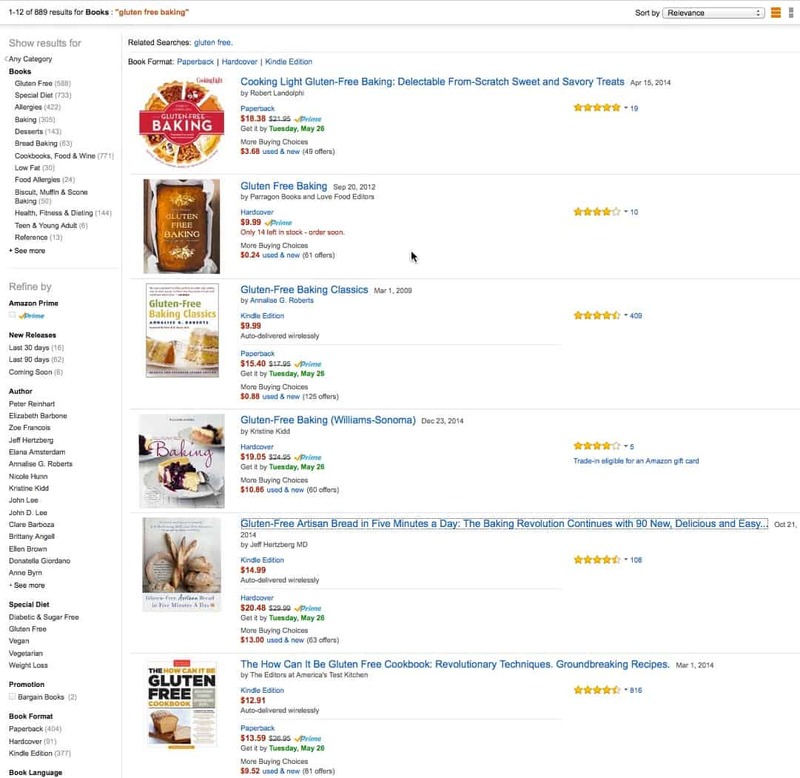 Once you have come up with your list of cookbook subjects, you will want to figure out the level of competition that exists in your subject. You want to find a subject that has some competition but isn't so popular that your cookbook will just get lost in all the other books. There are many ways to get a feel for the popularity of a subject. A great first step to determining the popularity of a subject is to do a simple Amazon search. From these searches you can get a good idea of the amount of relevant competition and the quality of the books. This search should be a book-only search, which you can set using the drop down box. You will want to do this search for different iterations of the words in your subject. To illustrate how to use the search to determine competition, we will use two sample searches, one for Gluten Free Baking and the other for Grilling Desserts. Since new books are always being added to Amazon, we've captured the search results in two images below, you can click on either image for a larger view. The first thing to look for in the search results is how many of the results are actually relevant to the subject. For "gluten free baking" the first 10 results are all relevant and specifically about "gluten free baking". This indicates a strong competition in that subject because all of the results are relevant, meaning your cookbook would be just one more book competing with all of these existing ones. Compare this to the results for "grilling desserts". Here, the books returned only lightly mention desserts in the titles and none are 100% focused on desserts. This means a cookbook focused on grilling desserts would definitely stand out. There are many ways to judge the quality of a book, but a simple method is to check out the aggregate rating of the reviews. Amazon provides the aggregate directly in the search results, which makes it easy to see how good the books are at a glance. It's important to look at both the number of stars, 1 to 5, and the number of reviews submitted. 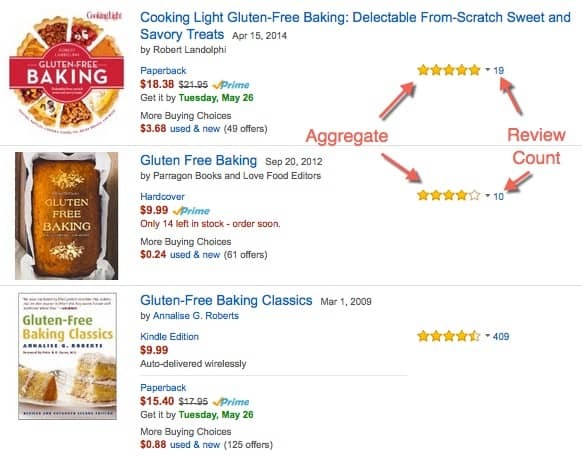 The cookbooks returned from the "gluten free baking" search are generally highly rated. The first few are all over 4 stars with 19, 10, and 409 reviews. The more reviews there are, the stronger the indication it is a high quality book. Generally, 10 reviews is the minimum to get a good feel for it. Anything over 20 or 30 reviews is a lot and should strongly indicate the quality of the book. 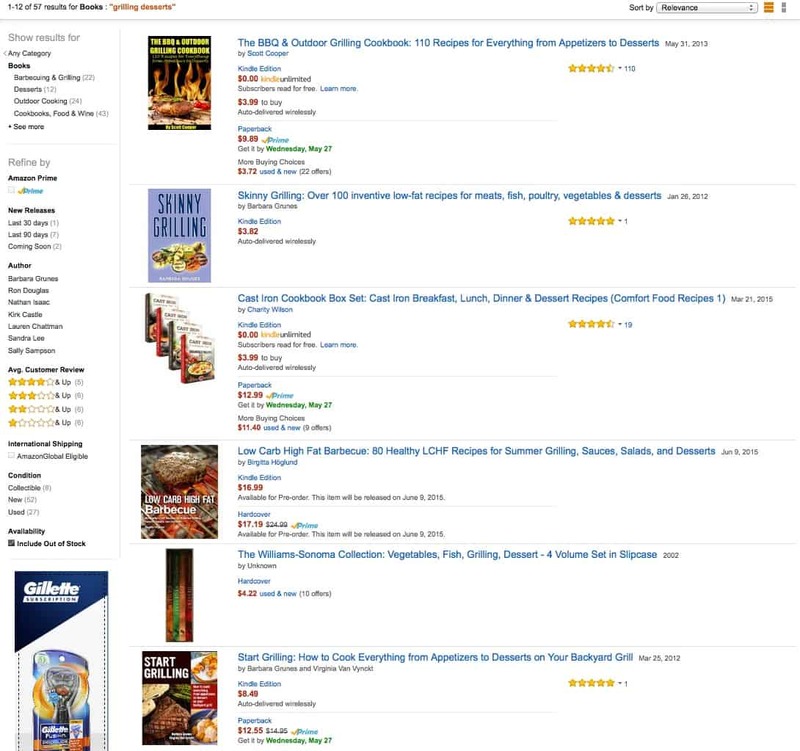 By way of comparison, only two of the "grilling desserts" books have more than 1 review. One with 110 reviews and the other with 19. Those two books are strong competition and most likely high quality but the others probably don't sell well and would be easy to displace with a strong cookbook of your own. If the subject still has potential after the General Amazon Search research, you can dig in deeper to the book results you have. Using the Amazon Sales Rank for these books allows you to estimate both the copies of the book sold and how hard it would be to break into the subject. Using the Amazon Sales Ranks is a more nuanced factor than some of the other factors. If all the competition has a very poor Amazon Sales Rank then it is a good indication that people actually aren't interested in this subject. Conversely, if all the books have good sales ranks you might have a hard time breaking into the category because these books would all show up above your book in the results. To view the Amazon Sales Rank of a book, click through to the book's product page. Scroll down the page until you find the "Product Details" section. It will list the "Amazon Best Sellers Rank" below the "Average Customer Reviews". If the book has enough sales to rank in a specific category they will also show up here. Another way to determine the popularity of a subject is through finding complementary and competitive products in the subject.